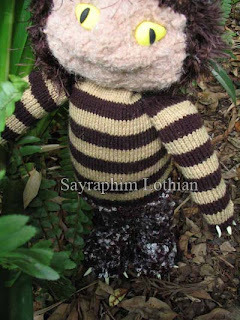 It appears that Where The Wild Things Are is generating huge amounts of interest all over the web. And so my last post is turning up all over the place (including on the excellent Puppeteers Unite site and the awesome popculture showcase Super Punch) and many people are popping over here to visit. Hello to you! Come, sit yourself down and have some cake. I’ve been getting a number of questions about which is my favourite Wild Thing. It’s a simple contest, and Carol has always won hands down. With his stripes he’s easily the most distinguishable of the monsters, and after all, although he doesn’t appear on the cover, Carol is the Wild Thing that appears in the two most famous images from the book, including bowing to King Max (I don’t have to link to these images. You know which ones they are!) I was thrilled, therefore, to discover that my favourite Wild Thing was the principal one in the film. After they finished filming the movie, we cleaned, washed, dried and packed every suit into huge wooden crates to send them back to the studios in America. (I asked what the studio was planning to do with them, and someone referred me to the end scene in the Indiana Jones Raiders of the Lost Arc, where they wheel the boxed up arc into a huge warehouse filled with similar crates) and we went home for the final time. I had a few weeks off before my next job, so because my head was still so full of monster images, and because I use art to process the things that happen in my life, I sat around and knitted a number of the guys. Carol was the first, naturally! and I knitted him for one of the standbys who was a close friend of mine (you can’t keep everything you knit, where would you store them all? Better to knit for other people say I!) I proceeded to knit the other guys too, but Carol is my favourite and I’d love to have the time to knit him again, this time for myself (ok, well sometimes that Other People rule has to be broken 🙂 But when the merchandising comes out for the film, I have to say that I’m probably going to be buying something of Carol and something of Max.